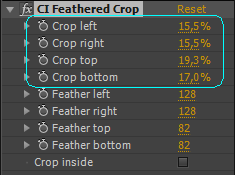 The Feathered Crop plugin will cut off (make transparent) either the outside or the inside part of selected crop boundaries, and apply feather transparency to the part that remains. It respects alpha channel of the source footage. Alternatively, it can fill the cropped area with color or apply border of a given color to the outside of the crop. 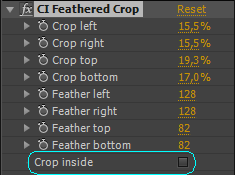 The plugin can be found in the effects group “Creative Impatience”, and is called “CI Feathered Crop”. To apply it, drag it over the layer, to the effects panel, or in CS6 double click. Crop section (Crop left, Crop right, Crop top, and Crop bottom) allow you to specify how much of any edge is cropped in percentage of the clip or layer size. The percentage amount was chosen due to compatibility with standard Crop effect in Premiere Pro, and to account for various sizes of the source footage. Feather section (Feather left, Feather right, Feather top and Feather bottom) allows you to specify how much feather will be applied to the inside. Feather is set in pixels, and can only be positive, meaning it will be applied from the crop boundary inwards. Crop inside switch toggles between cropping the outside, or cutting out the inside of the box selected in the crop section. It does not change the direction of the feather – it still goes to the inside. Fill with control allows you to fill cropped section with transparency or with a desired color. Border color allows you to select the color that will fill the cropped area. 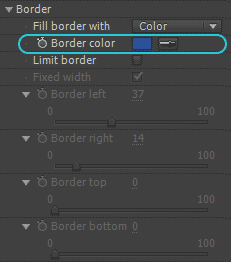 This control is active only when Fill border with is set to color. 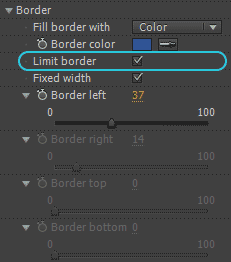 Limit border – when active – will limit the extent of the color fill to the size of the border controls below. 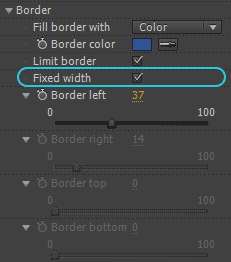 Fixed width will make the border size equal to Border left on all sides. Individual border width allows you to specify widths of the border of each side separately. You need to uncheck Fixed width to activate the controls. 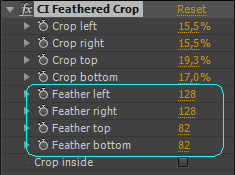 Cautionary note: Nothing apart from your common sense prevents you from inputting values that will invert the crop or feather boundaries – left becomes right, etc. 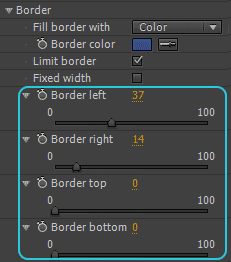 After clicking on the effect name, both in Premiere Pro, and in After Effects, custom controls will appear in the comp/layer window or program monitor. Crop handles are set in the corners of the rectangle which signifies the crop boundary. You can control the amount of cropping of the two adjacent sides. To scale proportionally, drag holding the SHIFT key. To scale symmetrically from the center, hold ALT/OPTION. Individual feather handles are present in the middle of the side that they control. They can only move to the inside of the given boundary – ie. left feather can only go to the right of the left crop boundary, but is not limited by the right. Joint feather handle is set in the upper left corner of the feather box, slightly to the lower right of the corner itself for easy access. It controls simultaneously all feather controls. The horizontal position sets left and right feather, while vertical sets top and bottom. Move handle is a box in the center of the crop rectangle, and dragging it will move all the boundaries, retaining rectangle size up to the moment of reaching the frame. 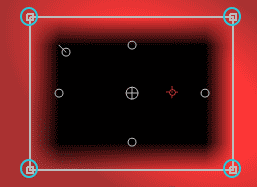 Cautionary note: moving the rectangle towards the border will decrease its size. Feathered crop was briefly mentioned in ProMAX webinar with Dennis Radeke from Adobe. Did you find a creative application for this plugin? Share the idea with the rest of us! Bart, Followed your path to install the “CI_feather_crop.aex” file from Creative Impatience, but it doesn’t show up in the CC or 2014 version of Premier. Thoughts? CC MediaCore folder is named 7.0, make sure you put it there. Having a hard time getting the plug in to download…I see it in a folder and when I click on it nothing happens. 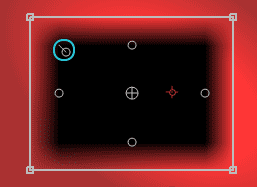 I have installed in the location given but it does not show in my effects any ideas? Somebody mentioned that for some reason CS6 might be the folder name for Premiere CC. I don’t see it here, but you might try to use it as well. I had trouble getting Premiere to recognize the plugin (Mac OSX) but it finally worked when I right clicked and chose “show package contents,” opened the Plug Ins folder, and then dropped it in the Common folder. I think Media Encoder and After Effects will not see the plugin if you put it there. When I use your plugin, whatever part of the video that I used the plugin on (for example an imported .gif or .mov or .mp4 clip) is not rendered in the output. When I play the rendered movie back the clip with feathered crop is missing from the video. If I remove the feathered crop and re-render then everything shows fine. I THINK I might have figured it out. I think I changed using Square pixels to Widescreen 16:9 and everything plays back fine. I will try to reproduce the problem tomorrow to see if it was the Square Pixels setting. I apologize, but at this moment in time I do not have access to Premiere CS5.5, and cannot assist you. I remember there were several bugs in the SDK that got fixed later in CS6, and that I did have issues I had to work around to make it work for CS5.5. I’m afraid I will not be very helpful here. It might actually be some unfortunate combination of media and/or pixel ratio or square media in widescreen sequence of things of that sort that you are experiencing. Hi, I have made great use of this plugin in the past, but recently switching to After Effects cc18 it doesn’t seem to be working and causing projects that use it to crash on loading, removing the plugin makes them work again. Am I doing something wrong? is the plugin compatible with After Effects CC18? i would hate to loose it as it is so much better than using masks for feathering. Thanks for the report. It seems I have to take a second look at this plugin. Unfortunately time has been scarce these days, I can’t promise anything will get done before the end of the year.